Henry T. Phelps, a renowned San Antonio architect, designed the 1913 Mills County Courthouse. The distinctive Neoclassical design features cast stone pilasters, pedimented entries, and “iron spot” Acme brick veneer, topped by a copper entablature and massive sandstone parapet. It typifies the Beaux Arts style of government buildings from the turn-of-the-century. 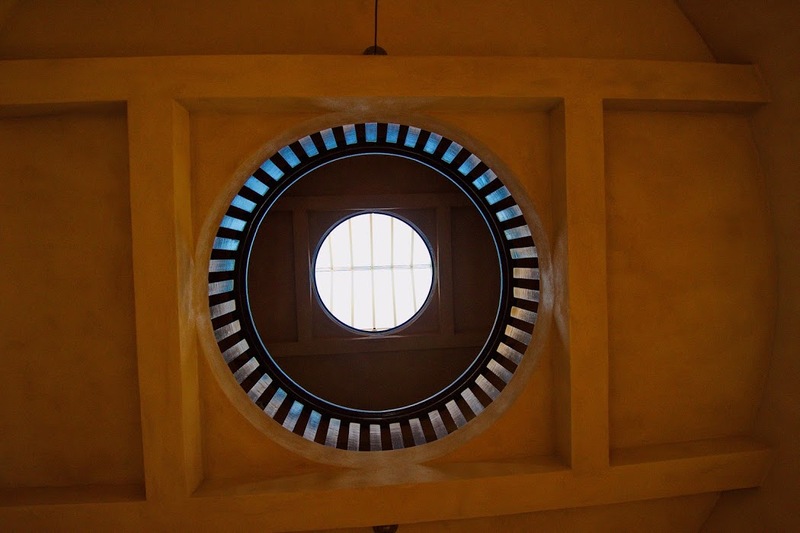 The interior corridors feature terrazzo floors, Georgia marble wainscots, integral color plaster walls and a miniature rotunda topped by a skylight bringing natural light (and originally ventilation) into the heart of the building. 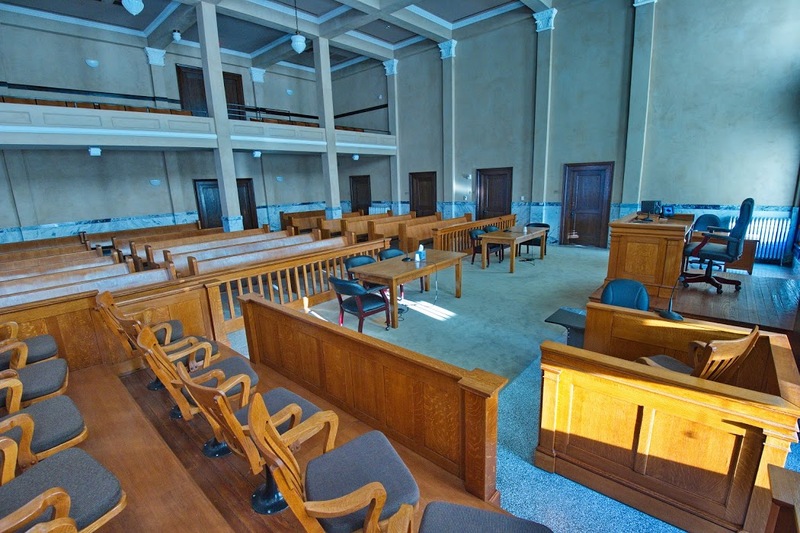 The double-height courtroom is distinguished by coffered plaster ceiling “beams”, all of the original courtroom furnishings, and a full spectator balcony with cast iron fixed seating. 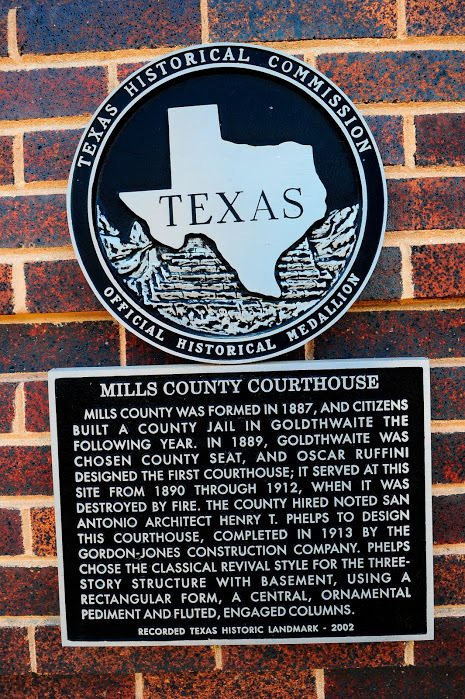 Mills County, founded in 1887, has had only two courthouses. The first county building on the courthouse square was the 1889 jail, which still stands on the corner today. 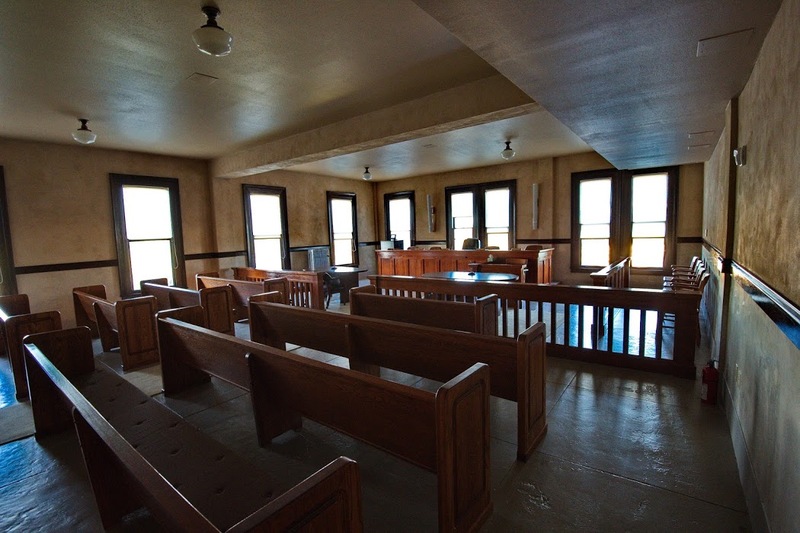 The first courthouse was built in1890, but burned in 1912 under suspicious circumstances. Like many courthouses during this time period, the new 1913 courthouse embodied state-of-the-art “fireproof” construction features, including structural clay tile walls, concrete framing, terrazzo and scored concrete flooring, and steel windows in the offices of the County Clerk and District Clerk to protect deed records and court documents. Listed on the National Register of Historic Places in 2000. Designated a State Antiquities Landmarks and a Recorded Texas Historic Landmark in 2002. The town of Goldthwaite was founded after the Santa Fe Railroad arrived in 1885 and was named for the railway official who auctioned off town lots. From 1869 – 1897, Mills County struggled with Indian attacks, outlaws, and vigilante justice. A reign of terror, including lynchings and assassinations, continued until intervention by the Texas Rangers at the turn of the century. A meeting in 1905 of the Confederate Reunion, a major annual social event, remains the single largest public gathering in the history of Mills County. In 1915, the striking Confederate memorial monument was erected on the courthouse square through public donations, the Self Culture Club, Jeff Davis Camp 117, and the United Confederate Veterans. In 1908, prohibitionists banned saloons, which had proliferated during the frontier days. The 1914 courthouse embodied a justice system that allowed the area to thrive. At the town’s peak in 1928, Goldthwaite had 2,800 residents (about a thousand more than today). 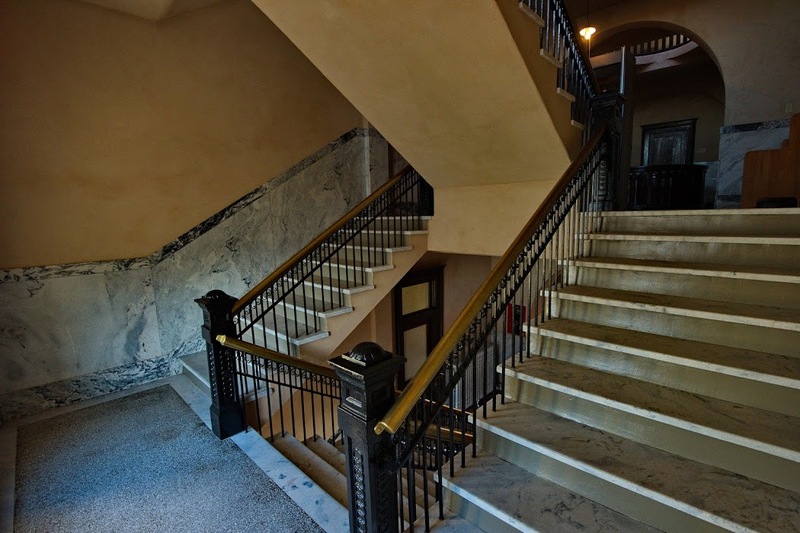 Restoration of the District Courtroom revealed cast plaster coffers, ornate pilasters, and balcony seating above a modern suspended tile ceiling. The plaster ceiling sagged considerably due to the asymmetrical placement of supporting columns in the courtroom, as though a row of columns had been accidentally omitted from the original floor plans. The warm-colored plaster, found throughout the building interior, was restored imitating the variations and texture of the original skilled artisans. While the main corridors feature Georgia marble wainscots, other areas are distinguished by wainscots using a smooth-troweled Venetian plaster technique as a substitute for marble. The plaster wainscot required specialized knowledge and considerable skill to emulate the original craftsmanship. Historic wall murals were painstakingly conserved in one basement room, advertising bail bonds, banks and barbers (everything a prisoner might need before a court appearance!). An acoustic plaster ceiling system was applied between each of the ceiling coffers to improve the acoustics and functionality of the District Courtroom. When the project started, the District Courtroom floor was covered with carpet. Once it was removed, the design team discovered a terrazzo floor instead of the concrete floor they expected underneath a thick layer of mastic. 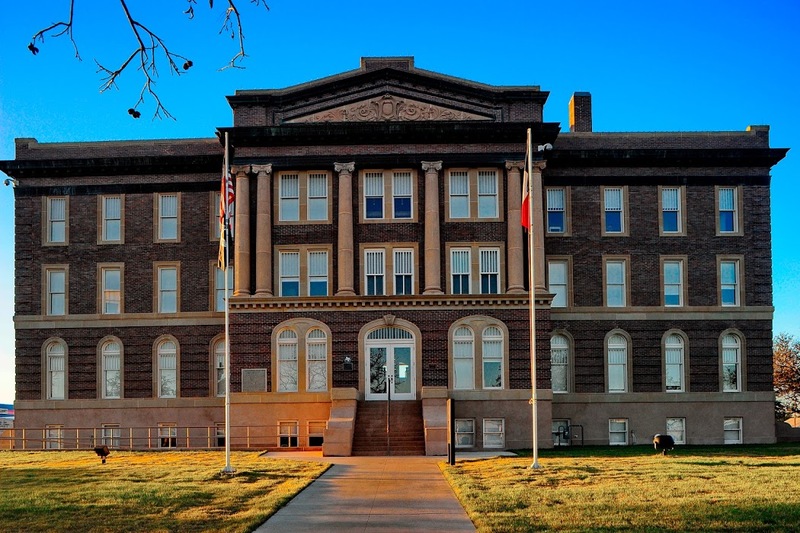 Through the Texas Historic Courthouse Preservation Program administered by the Texas Historical Commission, Mills County received a Planning Grant in 2005 to prepare construction documents for $253,545. In 2008, they received a Construction Grant of $4,372,459.36 to complete the restoration. A total of $4,626,004.36 in state funding was granted to Mills County. Marilynn Johanson led the Mills County Restoration Association throughout the construction project. During this time, the non-profit organization published a newsletter to communicate with county citizens about the progress of the work and dispel rumors. The group raised over $150,000 toward the county’s grant match funding. Former County Judge Rob Lindsay (now Goldthwaite City Manager) and current County Judge Kirkland Fulk maintained support from the Commissioners’ Court for the project through more than a decade, as the project progressed from the Master Plan stage, through grant applications, and finally construction. A rededication ceremony was held on August 27, 2011 in the District Courtroom. The highlight of the ceremony was a medley of patriotic American songs sung by the Mills Tones, a local men’s a cappella chorus. State Senator Troy Fraser and State Representative Sid Miller gave rousing speeches to a standing-room-only crowd of supporters. 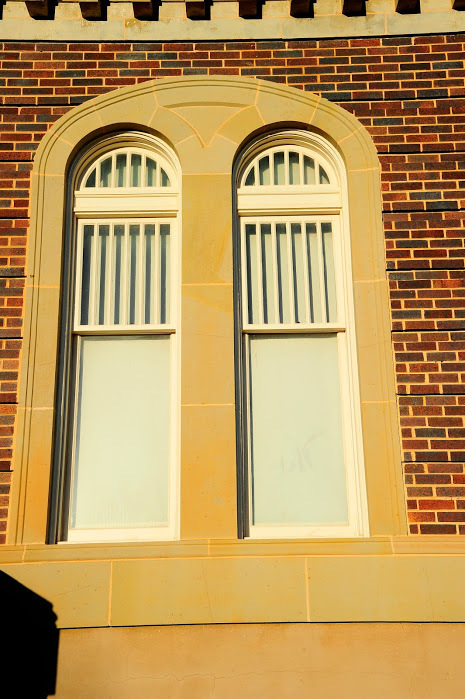 Read more about the dedication in the Brownwood Bulletin. 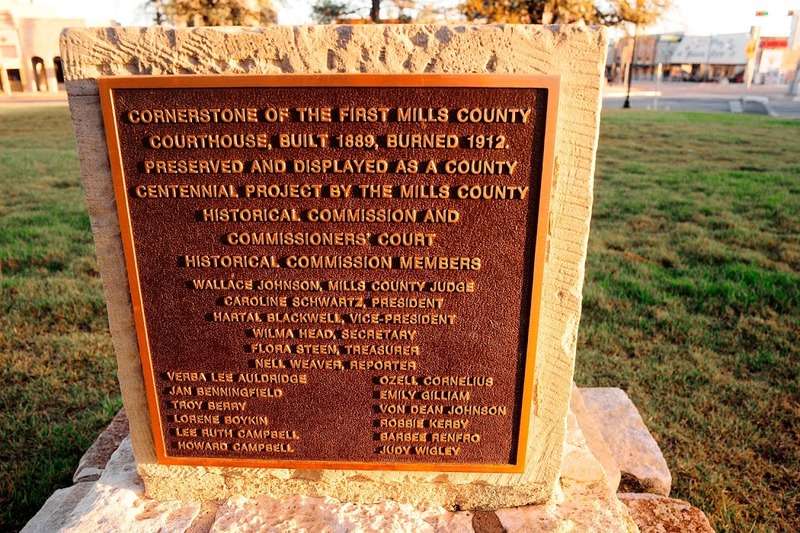 The Mills County Historical Museum can be found at 1119 Fisher St. in Goldthwaite. The Regency Suspension Bridge, locally known as the "Swinging Bridge," is a one-lane suspension bridge over the Colorado River. It is located at the intersection of Mills County Road 433 and San Saba County Road 137, both gravel roads, near a small community called Regency. The bridge saddles Mills and San Saba counties. Visit the tiny historical community of Star, including the Hamilton-Soules House and the Star Historical Museum on FM 1047, open Sundays 3–5 pm. Comanche and Clifton are nearby Main Street cities. 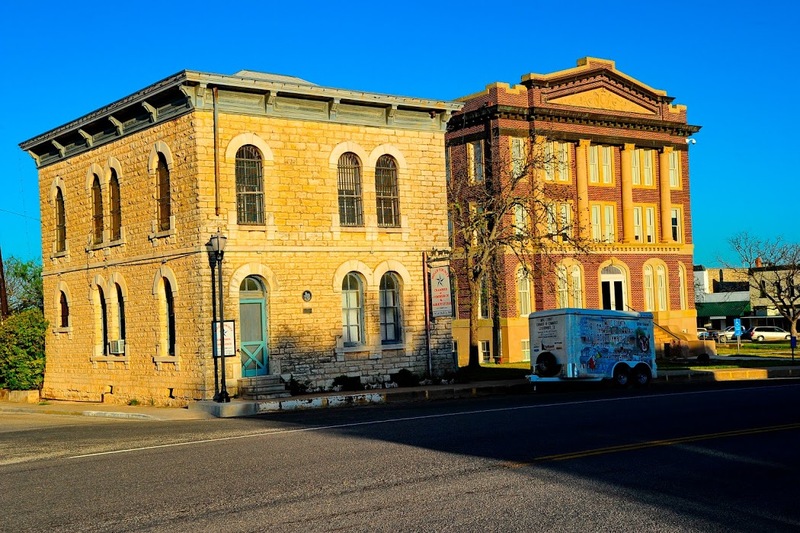 Visit the 1888 Mills County Jail on the courthouse square, the oldest governmental building in Goldthwaite, and listed on the National Register of Historic Places. There are 31 historic cemeteries located throughout the county. See THC’s Historic Sites Atlas for information. For more information about historic places and events in this region, visit the Texas Forts Trail Region. For more information about lodging, restaurants and businesses to help your visit be enjoyable, visit the Mills County Chamber of Commerce. Front facade of the Mills County Courthouse. Photo: Wayne Wendel.